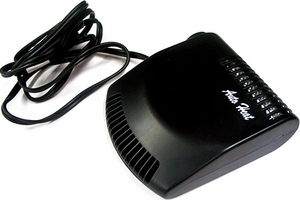 This little Portable 12 Volt DC heater defrosts windows and spot heats vehicles instantly; its sleek, compact good looks complement any car interior; cabinet remains cool to touch. 600 BTUs heat. Includes visor adaptable mounting bracket. Simply plugs into your 12 volt cigarette lighter receptacle.